Before remodeling the kitchen, the cabinet arrangement had a lot of wasted space. Either too specific for a use, like a full bay of vertical dividers. Or the polar opposite with a big, blank cabinet. At any rate, we knew lower drawers would help most problems. But corners are especially awkward and usually wasted. Knowing we wanted to remove the wall between the kitchen and dining room, we’d need to move the pantry. Living with every non-perishable item on the opposite side of the cook/prep area got old very quickly. With that in mind, keeping the pantry on the business side of the kitchen was a must. Hence the corner pantry. At 52 inches wide by 8 feet tall, we should have plenty of space to store dry goods. As listed in the original floor plan, we opted for a sliding door to eliminate an awkward door swing. After talking to several people, we decided not to use a pocket door kit. If the door comes off the track or needs to be replaced, it’s impossible. Instead, we went a similar, more user-friendly route with a bypass sliding door kit. Often used in closets, the track has two sides and roller wheels. Ben built a standard header, secured the track and covered the front with an MDF panel. Above, as seen from inside, without the door. Below, from the outside. In our case, the door opening is wider than the oven cabinet leaving the last few inches of door visible when completely open. I worried the 24 inch opening would be too small, but it allows easy access to everyday items. Shelves are 18 inches deep, extending into the corner. We plan to keep extra supplies here, to grab when we need to refill. Also, we’ve decided to keep the microwave in the pantry. This allows easier access and a shorter distance of carrying hot items. Which also frees up space in the smaller cabinet, allowing a full drawer set. I still plan to keep coffee supplies and extra serving platters over here. Now that everything has been cut and fits, we can take everything back out to paint. I’m oddly liking the wood door though. I’m undecided if I should paint or seal it. Thoughts? Once I’ve painted the inside of the pantry, we’ll set the shelves again and add trim to the fronts to cover the braces. It’ll also give us a lip to hide under cabinet light behind to help illuminate the shelves. 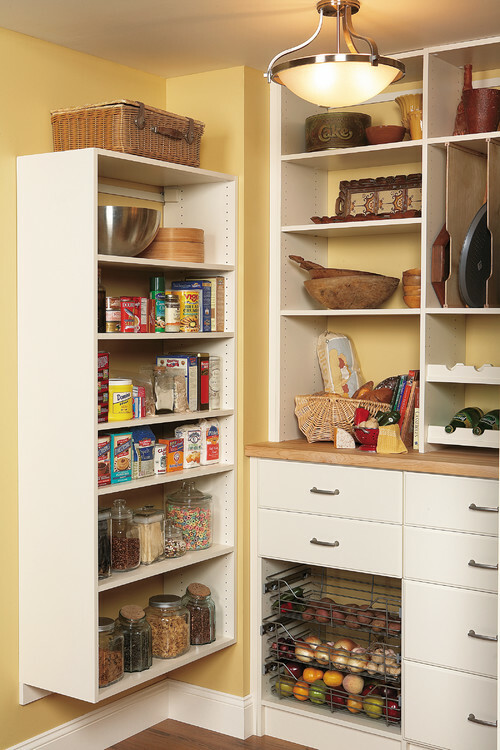 The overall depth of the pantry is 25.5 inches from the back wall to the inside of the door. 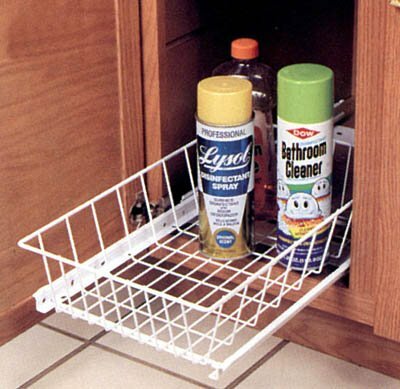 With 18 inch deep shelves, that leaves 7.5 inches between the shelf front and the inside of the door. By making the shelves narrower than the full depth, we won’t have to worry about things getting in the way of the door slide. It’ll also make reaching in the back area easier. We’ll probably keep a broom in here too. While I’m updating, I thought I’d include a shot of the closed door against the fridge. After settling on a sliding door, we agreed we didn’t want the header flush with the front of the fridge cabinet. Mostly to add some interest to the wall, but also because the door itself would sit 3/4 of an inch back from the front. Once that’s done, we can start organizing. We shop at Costco, which means we have produce for days. Getting bowls off the counter would be really nice. 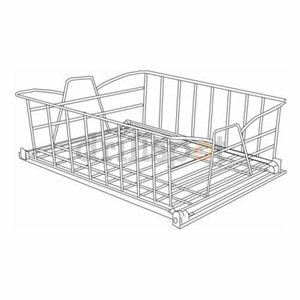 I love the function of roll out wire baskets, which can allow ventilation and easy access. I’ve yet to pin down exactly which ones, but here are a few I’m considering. 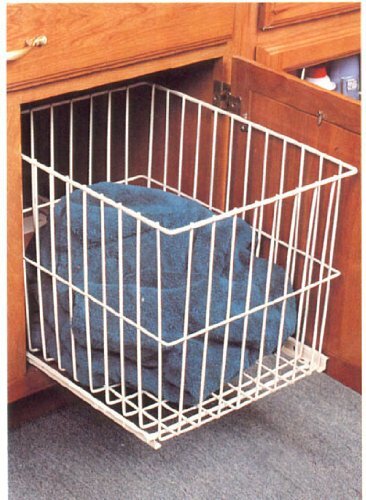 This one is actually a hamper, but the depth would maximize space. Perfect for storing bags of cereal and chips. Putting the corner to use and not having to walk around the island for everything is a game changer. Time for me to start painting so we can load it up! I like the look of the wood but wonder once everything else gets painted if it will look out of place. Maybe wait until other elements come together and then reevaluate? Otherwise, I would think painting it the color of the walls so that it blends in. That’s where I’m torn. The wood could add warmth, but in a wall of white cabinetry, it could just look unfinished and out of place. Thanks for your input! I absolutely love the wood! Plus, it’s a good connector for your countertops, hardwoods in the other rooms, etc. What a fantastic use of space, too! Once you get everything stocked on the pantry shelves, will have you to take out items on the left in order to access/remove items on the right behind the door? I had thought from the drawings that it would be a semi walk-in type pantry, with more room in front of all the shelves to reach an arm or shoulder in and pull things out. But would the door be in the way now? I’ve had kitchen cabinets like that, where the shelves go deep into an enclosed space, and I ended up not using the extra space inside because you have to pull everything out in order to reach the deep stuff. I like the wood! But I think it might stick out oddly if it doesn’t have the same look as the cabinet fronts. It might end up looking like you have one giant cabinet that’s different from all the others. I just updated the post to share a shot of the space between the shelves and door. Originally I had thought we’d have 12 inch deep shelves at the door with deeper shelves in the corner. Sort of a mini walk in. Then we decided to split the difference at 18 inches. It leaves enough room that something can be pulled out without shuffling everything around. It’s like you’re in my head with the door color. In a way, it could look great. But it could also look unfinished and out of place if left unpainted in a wall of white cabinetry. Oh yeah, I see it now. 🙂 It looked like there was an inch or three of gap from the original photos. That’s awesome, and I like hiding the microwave in there! I have to put mine on the counter, and it takes up so much freaking space! I actually really like the wood too. I’m normally a sucker for everything white or whatever, but I think it looks nice! It’s oddly nice there, right? Not sure yet which way that’ll go, but white is probably the most seamless. Thanks for sharing your opinion! I like the idea of a natural wood element in the kitchen. But I think Wendy above had the best idea–save the pantry door for last. That’ll give you a good idea how it will look finished in the space if stained or left a natural color. If you don’t like it then paint it up to match! I really like the warmth the wood grain would add. Painting it a “poppy” would be cool too! 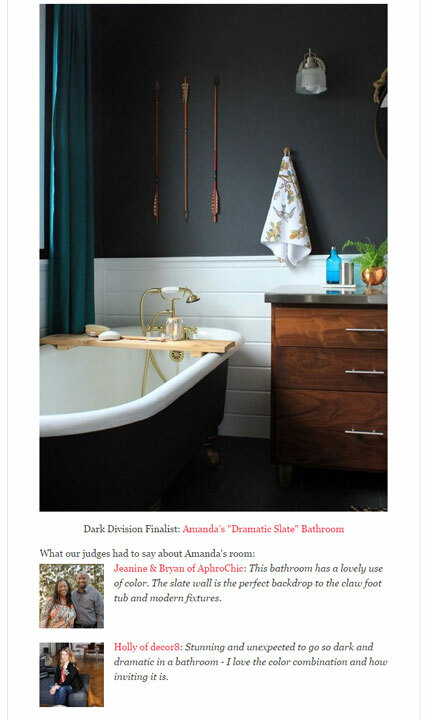 Or you could go totally cliche and chalkboard paint it? Regardless of what you decide, I love the direction the kitchen is going. You guys rock! That’s poppy *color*! 🙂 Typing too fast.